The most favoured brand event for pharmacists, in fact, this 'event brand' is a legacy brand with a great emotional bonding for pharmacists, it is the INDIAN PHARMACEUTICAL CONGRESS (IPC). This annual event is a time to RELEARN, RECONNECT AND REINSPIRE. 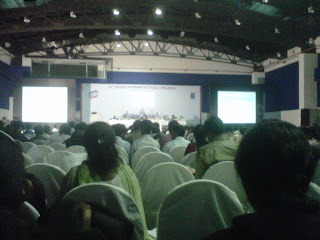 The IPC is held every Dec, this year's edition was at Bangalore (16.12.2011, 17.12.2011 and 18.12.2011). Bangalore is my place of stay since 1990 (when I came for studying M Pharma in Pharmacology at Govt. College of Pharmacy, Bangalore; I have come to Bangalore from Mysore my birthplace, Mysore is located 160 km from Bangalore; however, my family roots (ie., my parents' native place) are in Durga village, Karkala, Udupi district). 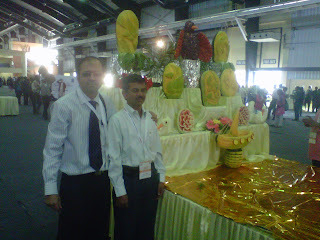 Naturally, the excitement level was very high since the IPC was making its presence in Bangalore almost after a decade. Thanks to the encouraging JMD of my employer company, our registrations to IPC were ensured and thanks to his support I could engage in useful relearning, reconnecting to my classmates and other acquaintances, and participate in the scientific session through a poster that I put up. 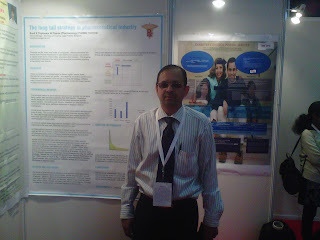 My scientific poster was on THE LONG TAIL STRATEGY IN PHARMACEUTICAL INDUSTRY. Chris Anderson proposed a concept: companies are offering many unique products sold in smaller quantities along with major brands. This, he said, contributes to a boost of marketshare, ROI and profits. In my scientific poster, I have extrapolated this concept to the pharma industry. I observe that companies (particularly MNCs) in the absence of blockbuster brands, are adopting a strategy like the long tail strategy to enhance marketshare or achieving other corporate objectives. a prominent member of the local pharmaceutical community. Mr. Biligiri was also an active person of the 63rd IPC's local organizing committee. It was fascinating to go around with Mr. S G Biligiri during the IPC event. With every two steps he took, three individuals would come up to greet him and talk to him! Such is his network!! 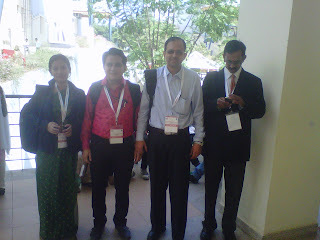 During the 63rd IPC, Bangalore I could also reconnect with dynamic Mr. Madhusudhan (third from reader's right, ie., next to me on my right side, the gentleman wearing suit, wedged between me and Mr. Biligiri). 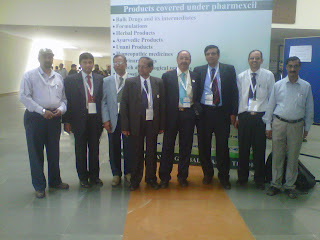 Mr. Madhusudhan is one of the leaders of Karnataka pharma industry. When I was a pharma student in the late eighties and early nineties, Mr. Madhusudhan was very active in the pharma circles of Karnataka as a leader of the corporate world. I had represented Karnataka in the national pharma elocution contest, three times - during my final B Pharma, first M Pharma and second M Pharma, and during all these years, the person who used to motivate us students - and take special care of us was Shri Madhusudhan. Golden memories!! When I met him, after all these years, Shri Madhusudhan remembered me!! I listened to his illuminating lecture, during the IPC, on 'data integrity and other manufacturing concepts as practiced in USA and India', (on 18.12.2011 at Cassia hall). Mr. Madhusudhan is currently based in USA. During the inaugural session, the Chairperson of 63rd IPC, Bangalore, Mr. Subodh Priolkar, General Manager of Colorcon gave an outstanding talk on the growth prospects of the Indian Pharma Industry. Later on, during the day, a talk by Ms. Aditi Kare Panandikar, Wholetime Director of Indoco Remedies, Mumbai, was riveting. Her professional commitment and scientific training was stark clear, this young professional was at her inspiring best. Her incisive analysis backed by hard data gave a precise view of the developing trends in Indian pharma, and the opportunity for new business models. Truly, she has a 360 degree view of the developing pharma business, and has kept herself abreast with the latest happenings of the pharma world. By George, Dr. George Patani, Director, Inga Laboratories, Mumbai was at his oratorical best. The attention getter example in his presentation, of the legal definition of land was very striking. He went on to present his concerns and views in a persuasive way - such as the challenge on the pricing front faced by Indian pharma industry. Mr. Ganesh Nayak, the pharma leader from Zydus Cadila group, was at his authoritative best talking on strategies and business models available for pharma enterprises in today's context. 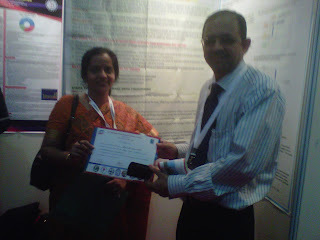 Mr. Nayak presented his talk on 18.12.2011, however, I could not listen completely to the talk, since I had to be there along with my scientific poster too. Dr. R B Smarta, a consultant spoke on an interesting concept of pharmacoeconomics. His talk was well illustrated with graphic elements. This emerging concept deals with pricing vis-a-vis therapeutic benefits offered, and consequently looking at the cost of therapy from a holistic angle. Mr. K Kiranshankar, a veteran marketer of the pharma industry, spoke on the current status of the pharma market from the 4 Ps point of view: product, price, promotion and placement. It was a ringside view of a practicing marketing artiste! 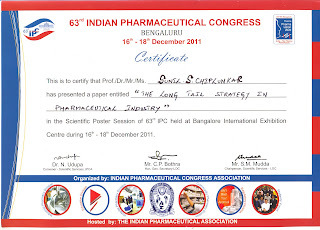 A pleasant surprise was the speech by Dr. G Parthasarathi, Head - Pharmacy practice, my B Pharma alma mater. He has grown rich in stature today, a leader and academic expert. He has also edited a text book on pharmacy practice, which I plan to buy shortly! His talk was well received and made high impact in the audience. 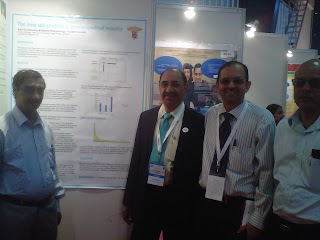 Dr. B R Jagashetty, Drug Controller of Karnataka, also lent his majestic presence to the show. Dr. Saranjit Singh, Dean, NIPER, Mohali gave a thrilling lecture on the level of impurities and their impact on exports. He gave exciting case studies on how a small change in level of impurities in a pharmaceutical formulation can become a barrier to selling in regulated markets! All in all, the IPC was inspiring, all about learning sessions, and reconnecting. I would have liked to listen to all the lectures, but it wasn't possible to be everywhere at the same time! Moreover, visiting the Pharma Expo requires a lot of time! So time is/was a constraint. The food and other arrangements were 'overall good'. 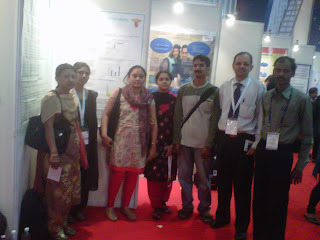 IPC @ Bangalore was a memorable one!! Thanks for reading this blogpost, please scroll down and click on older posts, as and when required to read all other posts. Thanks for a great post, Sunil!! As usual, you've captured an entire 3-day conference very lucidly in a few paragraphs. I am extremely interested in your poster. is there any way I could access it? Or could you share it with me? I think the concept of Long Tail in pharma is very interesting and applicable. Many thanks for your kind comments, please send me your e-mail id for sending across relevant material. R R Institutions is one of the Pharmacy colleges in Bangalore, which setup with a mission of imparting education to all sections of society, was established in the year 1993 to render highest standards of academic achievement with moral and social commitments.